I normally outline story in these first sections, but as far as I've been able to ascertain this game features no plot whatsoever. In Janosik you play as some chap with a tiny axe, who can kill bears and people with a single blow, yet whom immediately dies upon touching fish or pigeons. I am a relatively creative individual but I struggle to see any narrative based on these observations. I hate negative reviews as they often negate the fact hard work has been applied - especially so on a retro platform. Having said that though, I'm not the first person to give Janosik a grilling. I'm not sure how well Mirage's Atari version fared on release, but the Commodore Amiga version certainly didn't do too well. I guess that with that in mind, the source material wasn't the easiest to work with. I mean, the engine moves well, the enemies and obstacles are clearly defined but ultimately Janosik just lacks 'soul'. Or much in the way of fun. It's just all very bland. The game-play is incredibly simplistic. You move from left to right through the screens avoiding or killing enemies. The controls are workable but the jumping and the fighting are not Janosik's strong points. I didn't initially realize I was attacking - the chap looked more like he was pleasuring himself than swinging an axe. Sorry for being crude but seriously there is no other way of describing it. As for jumping, if you press up, you rocket forwards diagonally like Superman who has forgotten how to fly. It can gets quite difficult to leap gaps as some require pixel perfect landing. Graphics are alright. The trees look like trees, the people look like people and the bears look like Moomins. There are various colours to enjoy... Ok, I admit that I'm really struggling here. The screenshots speak for themselves really. On the other hand, the music is surprisingly decent. In fact of all the less attractive qualities the game has, the music alone is a very valid reason for playing it. The Spectrum isn't well recognised as a great platform for music but the developers really achieved something here. 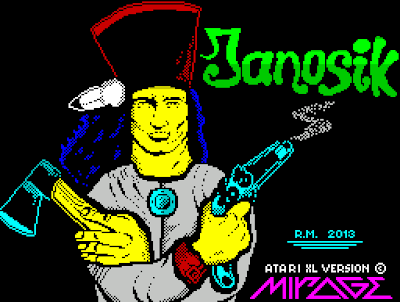 To conclude, in the grand scheme of the Speccy's immense library, Janosik is not a terrible game. The best I could describe it would be as 'passable'. Most of the elements hold together pretty well and the music is decent enough, but whilst playing there'll always be that nagging feeling that you could be spending your time better elsewhere. Download the game here (from www.speccy.pl).